With smartphones increasingly becoming the number one default device via which Mr Average takes snapshots - helped, somewhat ironically, by Samsung's own well reviewed Galaxy handsets - and with sales of compact cameras in decline, manufacturers now need to present a pretty compelling argument for the mass market to purchase a standalone camera. Samsung have decided to revolutionize the market by bringing together the camera and smartphone in one device - enter stage left the new Samsung Galaxy Camera which sports the marketing tagline "The Camera Reborn". In essence it's very much like the fusion of a Galaxy S III smartphone and a long travel-zoom camera like Samsung's own WB850F, with a massive 4.8 inch screen on the back and a whopping 21x zoom lens on the front. Indeed, the Galaxy Camera boasts the exact same lens as the WB850F, a 21x optical zoom with a focal range the 35mm equivalent of an ultra wide 23-483mm, supported by optical image stabilisation. There's also a similar 16.3-megapixel effective resolution from the standard sized 1/2.3-inch CMOS sensor sporting 17 total megapixels, which is physically much larger than the sensor that you find in a smartphone and therefore promises better image quality. On the back is a 4.8-inch 1280 x 720 (HD) Super Clear touchscreen LCD (TFT), identical to the Galaxy S III's screen except for the fact that it uses LCD technology rather than OLED. Both devices also now use the same Android 4.1 Jelly Bean operating system (after a recent Galaxy S III update). One crucial difference between the two devices is that the Galaxy Camera doesn't have any telephony features other than support for Skype or Viber through Android, so it's not going to replace your mobile anytime soon, although it is possible to send text messages if you choose to install (and pay for) a SIM card. The Samsung Galaxy Camera measures 70.8x128.7 x19.1mm, which means that its best stored inside a camera bag rather than a pocket, and weighs a manageable 300g without battery and card, making it about 25% bigger and heavier than the WB850F camera. Its undoubtedly a large device that will definitely get you noticed, especially given the attractive white finish and the large, protruding zoom, so it's not as inconspicuous as the ubiquitous smart-phone. Having said that, the ability to zoom-in to 483mm using a relatively compact device means that you will be able to capture lots of moments that no smartphone can reach. With what feels like a higher proportion of metal in the build than plastic, the Galaxy Camera's sleek and stylish exterior certainly looks the part. It actually features something approaching a proper handgrip with a subtly textured surface to one side of its faceplate - a feature usually jettisoned in favour of cameras that pander more to sleek styling. This thereby suggests that sharp shots towards the telephoto end of its zoom range just might be that much more achievable. Other than the 21x lens and the handgrip, the only other feature on the sparse front of the Galaxy Camera is a small porthole shaped window housing the AF assist lamp/self timer lamp, positioned just above the lens. This uncluttered presentation is due, in part, to the integral flash being moved to the top plate where it is neatly of the pop-up variety. If we've one gripe though it does seem to take an age to charge from cold before it can be fired. This wait might not be more than a few seconds, but it can take three squeezes of the shutter release before it will fire off a shot in flash mode. 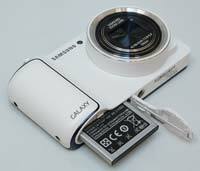 Looking down on the Samsung Galaxy Camera's top-plate with its back facing us, at the left hand edge is the aforementioned pop-up flash, with a manual switch for its activation provided on the left-hand flank. So the flash won't automatically fire unless you have raised it first. Give this a press with a fingertip however and the flash pops up with a satisfyingly solid metallic clunk. Simply press the spring-loaded contraption back down to deactivate. Located below the flash button is a pair of microphones. Also on the top-plate is a tiny inset power button. Hold this down for the first time and the Galaxy Camera stutters into life, taking almost 30 seconds to display a series of graphical screens and then extending the lens from within its body housing to maximum wideangle setting, while the rear screen switches to camera mode a couple of seconds later. The startup time from Standby is thankfully much quicker at just under 3 seconds, roughly what we'd expect from a point-and-shoot camera, although no speed demon. A half-squeeze of the tactile shutter release button and a central highlighted AF point appears in green along with the customary confirmation 'bleep' that the user is free to go ahead and take the shot. Do so either by using the shutter release button or with a tap of the screen and in default single shot mode a full resolution, Super Fine (top) quality image is committed to either th built-in 3.87GB memory or a micro-SD card in one to two seconds, which is impressive. You can even take a picture using the power of your own voice, with "capture", "shoot", "smile" and "cheese" commands all available. Voice control can also be used to zoom the lens, fire the flash, set the timer options, and change the shooting mode, amongst other settings. 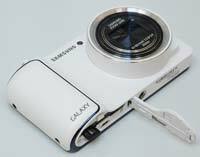 The Samsung Galaxy Camera's shutter release button is encircled by a lever for operating the 21x optical zoom; with a nudge from the forefinger the lens mechanics take five seconds to propel the user from maximum wideangle to extreme telephoto. While, once again, it's not the quickest response ever, this was still sufficiently responsive to enable us to quickly frame up the shot we saw in our mind's eye. When shooting video, the zoom takes more than twice as long to move through the same range, no doubt to minimize the already fairly quiet operational buzz. While this is fine, the initial response could be quicker. Press the virtual record button on the LCD screen and wait a couple of seconds while the 16:9 ratio screen display blanks out and then re-appears before recording begins - by which time the subject you were attempting to frame may well have moved on. The Smausng Galaxy has an array of beginner and more advanced shooting modes. The subject recognizing Auto setting is point and shoot all the way, the camera getting it mostly right, although - typically - busier scenes can confuse the auto-focus and the shutter will still fire even if the image is noticeably soft, so you can occasionally come away with blurred results. No matter, re-compose the shot and simply try again. The Smart setting is essentially a range of 15 different clever scene modes, including the useful Macro and Panorama modes. There are also 13 creative filters available which are accessed by pressing the arrow icon at the botoom of the touchscreen, useful for previewing and adding a not-too-cliched effect. The Wi-Fi options here are many and varied, and include the ability to sync up with a handset in order to use your phone as a remote viewfinder. There's also the ability to let the camera search for a local wireless network in order to directly upload imagery to the likes of Facebook, Picasa, YouTube and the ilk, or connect to a wireless network to email a selected picture to an email account - the address input within the camera with the aid of an on-screen 'qwerty' keypad. There are further automatic wireless back up (either to your desktop or a cloud service) and TV link options for those who have the relevant tech at their disposal. Pressing the Home icon in the top-right of the screen fires up the Galaxy Camera's default screen, which displays the time and date, allows you to perform a Google Search, includes icons for the Paper Artist, Instagram, Photo Wizard, Video Editor, Camera, and Gallery apps, plus Dropbox, Play Store and a further Apps icon which accesses all 41 default apps and the Widgets screen. Having the ability to connect to a wi-fi network (or cellular data if using as SIM card), then edit your images and video with either the Samsung apps, Instagram or any one of hundreds of other Android apps, and then upload them to your favourite online network quickly becomes compulsive and makes the traditional process of downloading to acomputer seem laborious and old-fashioned. If only all cameras offered the same out-of-the-box connectivity of the Galaxy Camera. With the 4.8-inch screen swallowing up the entire backplate of the Samsung Galaxy Camera, there are very few other physical controls. A plastic flap protects a port for AV/USB output on the right-hand side, with a metal hoop for attaching a wriststrap just below and a headphone port just above. On the bottom of the Galaxy Camera is a metal screw thread for a tripod provided slightly off-centre, and alongside this a catch operated compartment holding both the supplied battery, mini-HDMI port and a vacant slot for a micro-SD memory card and the rechargeable 1650mAh battery.